Hello … now pleased to present to your attention his new job – Lignum … port themes for symbian 9.1-9.3, which the author Rakot. I confess this is my most harmonious theme … Contrast-colored cherry wood and wenge barcelona very appeasing, and carved pieces of glass and metal perfectly complement the overall style of composition. The original author of the idea in favor Rakot, it is he has kindly given me his project not yet ready themes. Three weeks of labor and version 9.4 is ready. .. Archive of the topic contains: version threads Rakot Seth and icons firmware pack wallpaper psd file to make to your taste and color. 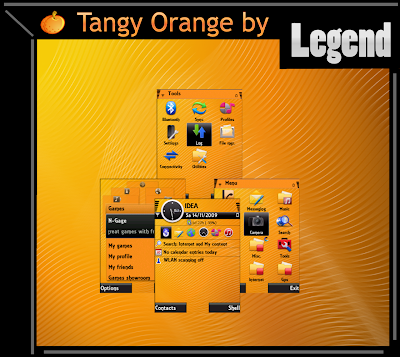 * Tangy Orange is compatible with all Symbian Os 3rd edition. * Includes Special Folders Icons for Fp1, Fp2. * Fits both portrait and landscape modes. * Compatible with Symbian Os 3rd edition, 9.1, 9.2, 9.3. * Rock My Way by Legend is compatible with all Symbian Os 3rd edition. * Nahid Touch icon & Tehk seven icon pack included. * Includes Special Folders Icons for Fp1. * Compatible with Symbian Os 3rd edition, 9.1. * Not Compatible with Nokia 5800 XpressMusic & N97.